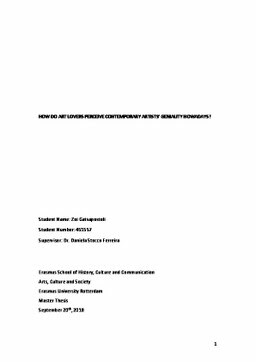 Erasmus University Thesis Repository: HOW DO ART LOVERS PERCEIVE CONTEMPORARY ARTISTS’ GENIALITY NOWADAYS? HOW DO ART LOVERS PERCEIVE CONTEMPORARY ARTISTS’ GENIALITY NOWADAYS? This thesis aims to explore if there is a “shift of worth” (Boltanski, Thevenot, 1999, p.15) in the notion of the geniality of contemporary artist. Modern culture is based on a system of distinct orders of worth (grandeur) and criticisms are based on a discourse over criteria of justification (Boltaski, Thevenot, 1999). According to Boltanski’s and Thevenot’s “world of inspiration”, the audience admires artists when its work has qualities of inspiration. In relation to the sphere of inspiration, Heinich recognizes that contemporary art is being dominated by the value of individuality. She compares the moral “register of artistic singularity” with the “system of communality” (Laermans, 2000, p.4) based on a value of conformity that strengthens the social, the collective, the public (Heinich 1998c, p.11). In this journey, my theoretical lens was pragmatic sociology and sociology of arts through the work of Nathalie Heinich’s and her neutral, descriptive and interpretive perspective. The research data was collected by thirteen semi-structured in-depth interviews with Dutch art lovers, men and women between the ages of eighteen to thirty-five. Using thematic analysis in order to observe the perspectives of different interviewees, both highlighting similarities and differences and unraveling unanticipated insights. It is described as a “presentation of an auditable decision trail, guiding interpreting and representing textual data” (Nowell, Norris, White, Moules, 2017, p.1). it was a useful method for systematically identifying, organizing and summarizing key features of a large data. Since my research was about collective perception and idiosyncratic nuances and experiences this method seemed the right one whilst focusing on meaning across the data set. The findings showed that participants validate and acknowledge geniality bestowing values such as innovation, originality, cleverness, excellence and clarity in the concepts and the composition of the artworks. What came up also as a tendency was a strong connection between moral and ethical elements of the artist’s personality.